Home / Blog • Featured • Headline / Elite Duathlons, half and full marathons, and the odd twitch! There has been more great racing last weekend from the Goalspecific Team, but before I celebrate the successes of the athletes achieving their goals this weekend, I have to mention those that performed the weekend before! 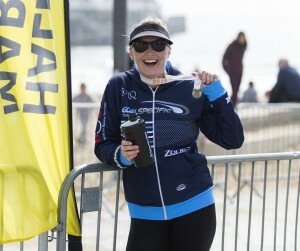 We had Rachael, Bex and Oliver (unfortunately due to illness I missed out on this one) racing at Portsmouth Duathlon. Significantly better weather than last year, and first duathlon experiences for both Rachael and Bex (only Oliver’s 2nd duathlon to date!) Rachael stormed the first run, coming in 3rd overall, with Bex not far behind, feeling some heaviness in the legs after racing the week before. 8 (or is it 10, I cant remember) laps later they were all back on to the 2nd longer run section. Bex had to hobble through cramp, but battled onto the end, and Rachael just wound up the pace on the run to finishing strong. Oliver posted a few pbs as well so a good day out racing! Meanwhile Marianne was running in the Yeovil Half marathon to test out the legs after a very nasty bug. It would seem that despite taking it steady she is in good form! A real confidence booster. Helen was also running but off road for her half in the Dorset Oozer running it in one of her fastest off road times, another cracking result. Onto this weekend, we had George and Marta running the Bournemouth half marathon. George was hoping for a windless day to have a crack at a half pb, but the wind was against him for the first 6 miles, which is tough running along that sea front! However, he still managed to finish 5th overall in a time of 1.20 which is not to shabby! Marta is going from strength to strength and smashed her time at Weymouth half, so again, it’s all heading in the right direction. Catherine was in Manchester, competing in the Marathon and after a tough week still went out and ran one of her fastest ever marathon times, which is really impressive considering how mentally exhausted she must have been going into it. Dave tested out his new TT bike in the Southampton Twitch. It sounds a rather interesting set up, where post swim you have to run down a fire escape to get to T1, but I suppose its the same for everyone! He went to work on his TT bike dodging the ponies in the New Forest, and finished with a solid run and most importantly smashed his friendly rival mate out of sight:-) A great first race of the season. Finally but by no means least, Becky was racing in the Elite Duathlon Championships at Bedford. 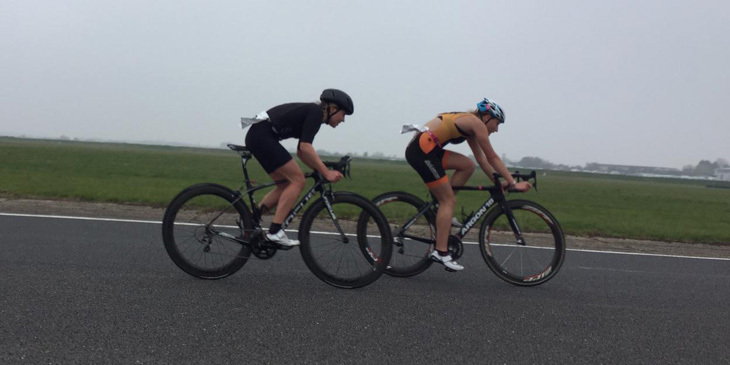 Far from her favoured distance, and certainly not an A race, Becky went in to see how the running was progressing, and to gain some great experience and practice racing in a draft legal event. Well, she smashed her 5k pb coming in 18.50 in the first run, and as always, put in an impressive bike (see main pic), to finish 5th elite female overall. Fantastic achievement.